This post started out life as an Instagram caption, however as it became longer and more personal I figured that my blog would be better suited as a home for what I have to say. This is the most honest and open I think I have ever been about my life outside of my online presence, but the issues here are important and relevant to current things going on in the world. For those of you who are unaware I started working as a Waterstones bookseller in November of last year. I love my job, however yesterday I had an interaction with a customer which made me unbearably angry and frustrated and I felt like I needed to share it. A lady came into our store with her daughter (roughly 13-14 years old) and asked my colleague where our teen section was – he directed her to it and left them to browse. A few minutes later they returned to the till with a couple of books they wanted to buy. We’re currently in the middle of handselling The Hate U Give to customers as it just won our Children’s Book Prize, so I briefly explained the plot and why it’s such an important book. The lady then proceeded to say to me ‘why do all of these teen books sound so depressing – it’s no wonder they all have mental health problems’. I was completely taken aback by this comment and just about managed to stay composed in my response to her. I’ve had a full 24 hours to mull this over and I wanted to write this post as a response to both comments like this one, and the general attitudes towards readers of the teen and YA genres. I am now 23 years old and although I’m not really part of the target age range of YA books, they still make up the vast majority of everything I read. Like most of us who regularly read YA books, I think there is depth and meaning to them which is not found in most adult fiction. YA authors are amazing at taking the issues which young people face and writing about them in a way which is both heartfelt, insightful and overwhelmingly helpful for the reader. 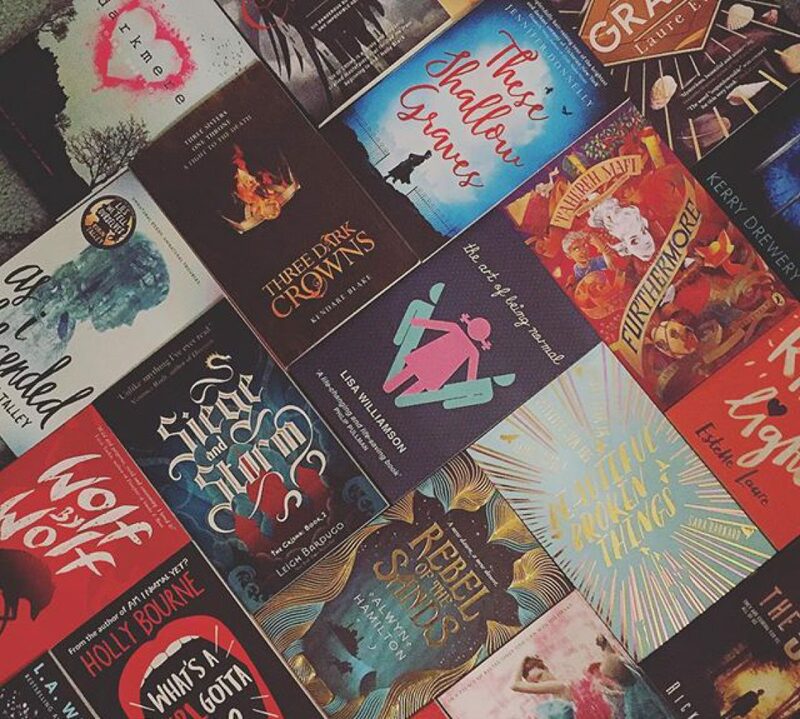 The number of new YA releases which either tackle aspects of mental health, gender politics or issues facing marginalised members of society have grown exponentially within a short space of time. However, for those who are intimidated by this openness or simply do not understand the source of these issues there is a need to place blame on what teenagers are reading, watching or listening to. The stigma and lack of understanding which still surrounds the teenage experience are one of the true reasons why books like these are vitally important for young people today, and the way in which they deal with this is why the YA genre is so beloved by so many of us who are now adults. Last year I read Eliza and Her Monsters by Francesca Zappia right in the middle of one of the toughest periods of my life so far. As I was reading I began to notice similarities between my own mental state and that of the protagonist. Eliza is introverted, uncomfortable in unfamiliar situations, and at points, has long stretches of time where she chooses not to leave the house. Through reading this book I realised that the feelings I had been experiencing over the course of several years were the result of severe and crippling anxiety, and I was able to begin to take steps to do something about it. So, why does YA matter? YA matters because it gives a voice and support system to those who otherwise would have none. YA matters because it changes lives and in some cases even saves them. It did for me. Sometimes when reading a book it can be really hard to separate your own subjective view from the topic that the book is dealing with, especially when this topic is related to some kind of illness. This is a really challenging book to review and was a very interesting – if not sometimes infuriating – read. The overall premise of the book is not one I’ve seen before and it was tackled really well, which is part of the reason why I found this book difficult to get through. Flora is a 17-year-old girl who has suffered from anterograde amnesia ever since she was 10. This means that she has almost no short-term memory and forgets things within a couple of hours. She uses post-it notes to remember important things, relying almost entirely on her parents and best friend Paige to help her through her day-to-day life. This all changes when Flora is kissed by her best friend’s boyfriend the night before he moves away, a memory which sticks in her mind without the help of her tools. Flora comes across as very innocent and naïve, with her mental age essentially being stuck at the point at which she developed amnesia. This is where some of the most interesting parts of the book are found – watching Flora try to reconcile her mental age with her physical. There are multiple points within the book where Flora catches a glimpse of herself and does not understand why she looks so much older than she thinks she should, which is kind of heartbreaking and just made me want to give her a massive hug. Flora as a character and her development is such a crucial focus of this book and is by far and away my favourite thing. Flora is the very definition of an unreliable narrator and there are some very good plot twists towards the end of the book which explain more about how she developed amnesia and why her parents are so reluctant to allow her to be her own person. The nature of Flora’s condition means that we as the readers will be told things multiple times as she learns, forgets and relearns them, which is where one of my main problems with the book lay. It can be very frustrating as a reader to read almost the exact same sentences over and over again – but the author is doing so in order to give us as accurate an interpretation as possible of what it is like to live with amnesia. Once I had got that into my head I started to enjoy the book more for what it is and really come to love Flora and her personality. My other main problem (which was a genuine issue and not just me trying to get my head around the premise) was that the one event that Flora could remember without having to read her notes was being kissed by a boy. This is the thing which really kick-starts her character development and makes her think that she is starting to get better, but I really wish that something less obvious and eye-roll-inducing had been used. This whole part of the plot is pretty much hitting you in the face with a hammer with the words ‘love can cure anything’ written on the side, which is such a problematic and unrealistic message to convey when a serious illness is involved. This also sets in motion the most unbelievable journey of self-discovery that I have ever read, in which Flora chases said boy to a different country purely based on her one memory of their kiss (oh how this part nearly made me DNF). It absolutely cannot be denied that Emily Barr has managed to present a deeply successful portrayal of amnesia within this book. I just wish that the romance aspect hadn’t been such a focus and that Flora was allowed to find her path in a more natural way. I received a free e-book copy of this book from NetGalley.com in exchange for an honest review. I wasn’t too sure what to expect going into this book – the synopsis on the back is deliberately very vague and doesn’t give much away (which, side note, is such a relief – I’m so sick of books giving away almost all of the important plot details on the back). However I was pleasantly surprised, with this book giving me the dystopian fix that I didn’t realise I was missing. Broken Sky is set in a dystopian version of 1940’s America, which has been divided into the Central States and the Western Seaboard. The Central States are under the control of a dictator who rules according to his ideology, ‘Harmony’, which is based on astrology. Star charts are used to determine how likely individuals are to cooperate with the regime, and anyone who appears to threaten this is labelled as ‘Discordant’ and sent to a correction facility. Amity Vancour, our main protagonist, is a highly respected pilot for the Peacefighter Corps of the Western Seaboard, until she discovers the corruption within the organisation of which she is a part and is forced to go on the run. There are some incredibly clear parallels between these themes and the real events which were taking place in this time period in our history, which I found fascinating. My favourite kinds of dystopian novels are those which take inspiration from real events. It took me a little while to get a good grasp on the world of this novel, but once I did I found it to be one of the most compelling fictional settings that I have read about for a long time. Amity is a fantastic female lead – totally capable and self-aware without any of the ‘chosen one’ syndrome which tends to be a defining characteristic of many female protagonists. She is active in pushing the story forward yet still makes human errors. As far as I can tell this series is not heading in a direction where Amity is the only character capable of leading a rebellion or revolution, and I will be disappointed if this does happen. Part of what I enjoyed the most is that the book feels like a real breath of fresh air compared to many dystopian I have read over the years. Then we have Kay, a cynical astrologer who is our secondary lead. Kay does not believe in Harmony, instead using her ability to interpret people’s charts to further her own ambitions of power. Kay is a very interesting character and not a great deal of her motivation is revealed in this first book, which makes me intrigued to see where the character goes in the rest of the series. I think it was the right decision to give Kay far less frequent chapters – allowing the right amount of space for her story to develop without it seeming dragged out. Initially the plot takes a little while to get moving, instead preferring to allow time for world-building and introducing the characters. Once the story does get going however, it doesn’t let up at all, ending on a fantastic cliff-hanger which I totally didn’t see coming and left me desperate for the second book. I want to try and make a regular thing of posting unboxings of my subscription boxes (but obviously will wait a while before I do so I don’t spoil the contents for anyone!). I have subscriptions to both FairyLoot and Illumicrate, which are both UK based boxes so my shipping charges aren’t astronomical. Both boxes cost £30 each time – FairyLoot is monthly and Illumicrate is once every 3 months. Shipping for me is around £3 (but check when you order, especially if you’re not based in the UK). The January box was my first experience of FairyLoot other than lusting after the boxes posted by other people for months. Every month in the theme announcement post there are always hints to what the book is going to be, so you can either wait and enjoy the surprise when your box arrives, or like me do some digging and try and work out what it will be (just so I don’t go out and buy the same book before I get the box – this has happened to me before!). There is also a ‘if you liked ‘x y and z’ then this box will be perfect for you’ section which will give you an idea of the themes of the items included if you don’t want to know the book outright (for January these included The Night Circus, Sherlock and Alice in Wonderland). The hints to the January book were actually the main reason that I decided to subscribe in the first place – I worked out almost straight away that it was going to be Caraval which was one of my most highly anticipated books of 2017. I completely loved everything in the January box – I never expected to receive a cushion cover in a book subscription box! The candle is a gorgeous mix of berries and cocoa and is probably one of the first that I’ve received from a subscription box that I would have chosen myself. The copies of Caraval which were included were the UK hardcover editions, which have one of four designs underneath the dustcover. I got the clock design which was my favourite of the four. Also the added bonus of receiving the book a week before its release date was pretty cool (although I’m not too sure whether this will have also been the case for international subscribers). £30 may initially seem like a lot of money, but considering the sheer amount of stuff which was packed into this box its more than worth the money. The book itself would probably be £9.99 on release in most UK bookstores, and the cushion cover could easily be priced at £15-20, so you’re essentially getting the rest of the contents (which I reckon would be worth around £30+) for free. I would absolutely recommend FairyLoot to anyone who’s ever considered getting it in the past – if you’re not sure then they always offer boxes as single purchases so there’s no subscription commitment. There are also always discount codes for 3 and 6 month subscriptions floating around on Instagram and Twitter – if you find accounts for the FairyLoot reps they usually have a code in their description/biography. I’ve already received the February box so should hopefully have an unboxing for that up within the next week or so. First of all let me say that when I started reading this book I was unaware of the controversy surrounding it, and it was only when I was halfway through that I first saw comments regarding racism and ableism. I have based my opinion of this book solely on the book itself, and not on the wider issues surrounding it. I am not an expert on the issues which have been raised so do not feel that I am in a position to comment on them appropriately. If you do want to investigate these, I have linked a couple of the most helpful pages below. Carve the Mark is marketed as a YA Star Wars, an epic space opera set in a world where everyone develops a ‘currentgift’, powered by Roth’s version of The Force. The two main characters, Cyra and Akos, come from two opposing cultures which share the planet Thuve – the peaceful Thuvesit and the ‘savage’ Shotet. Akos is the son of one of the three Thuvesit oracles, while Cyra is the sister of the brutal ruler of the Shotet and has a currentgift which is exploited by her brother in order to torture his enemies. Following an attack on the Thuvesit by the Shotet that results in Akos and his brother being kidnapped, the two characters are thrown together into a story which had so much potential. The overwhelming majority Akos’ part of the book is him being inducted into the ways of the Shotet for reasons which were never really very clear, which leads to many text versions of training montages. My biggest problem with this book was the worldbuilding. I never really got a good grasp on the geography of the universe, with interchangeable names being used to describe planets and cities, meaning that it was hard to tell where events were taking place at any given time. There is a map at the front of the book (and embossed on the front of the hardcover which is a cool touch) but it doesn’t really do much to help with this issue, only showing the locations of the individual planets in relation to each other. Also, very little actually happens during the course of the (pretty substantially sized) book. When you consider the actual number of pages which aren’t just characters sitting around throwing exposition at each other, this book could have probably been at least 40% shorter. Which brings me nicely on to the topic of wasted POV characters. Using multiple POVs can be tricky – each character needs to have enough development to justify devoting a large portion of the book to their perspective. Like in Allegiant, one of the POV characters here works better than the other. I thought that Cyra was genuinely compelling and interesting and had a story that I cared about, and I wish that the story had just been told from her side of things, with a prologue from Akos to set up the main events. Akos just isn’t a very well realised character, coming across as the generic male hero who exists solely for the female to fall in love with. He also has the fortunate ability of being the only person able to resist Cyra’s currentgift, which only serves to push the two characters towards the inevitable. Mercifully, this plays out over a longer period of time than in most other current YA novels, which I’m glad for because I prefer watching relationships develop rather than being beaten over the head with them from the start. I probably should have lowered my expectations of this book significantly based on my thoughts of some of Veronica Roth’s other books. I allowed myself to get swept up by ‘pretty cover syndrome’ and forgot the fact that I hated Allegiant, her last attempt at a multi-POV book. Regardless of any of the problematic social issues which litter this book, the biggest disappointment of all is that it’s just not very good, when it could have been fantastic. Every now and then a book will come along that the rest of the world seems to fall completely in love with but just doesn’t seem to work for you. Heartless was one of those books for me. From everything I saw in the run-up to its release I thought that I’d love it – especially considering Marissa Meyer’s previous adventures into retellings. But there was just something about the plot that really didn’t grab me and I almost DNF-ed this within the first few chapters. Heartless essentially provides the backstory to the Queen of Hearts and tells how she became the ‘off with their heads’ screaming maniac that we all know. Catherine is the daughter of a marquess and dreams of opening her own bakery. However, her mother has much higher aspirations for Cath and pushes her into gaining the attention of the King of Hearts. Obviously the idea of marrying an older man (Cath’s age is never mentioned but I’m guessing around 18/19?) is her worst nightmare but Cath opts to enter into a courtship with the King in an attempt to convince him not to marry her. Throw in a mysterious-yet-attractive court jester, a dash of insta-love and some more familiar characters from Lewis Carroll’s stories and you can probably guess where this story is headed. Don’t get me wrong, Meyer’s writing style is still fantastic and I did enjoy her interpretation of Wonderland, but when I read a retelling I want it to be dark and completely twist what we think we know about the original story. I just kept waiting for a real shock moment which triggered this but it never came. The end of the book felt rushed to me and the transition of Cath into darkness didn’t really work. The climactic event which caused her shift was predictable and didn’t really have as much of an impact as I was expecting. I would have much preferred an ongoing series of events which alienated Cath from her peers and led up to a high-stakes climax which finally broke her character. Cath was a problematic character for me. She started out really strong (once I’d reminded myself that this is set in Wonderland hence the incredibly whimsical way in which she speaks) but she never really seemed to develop much. I get that she was from a ‘noble’ family so there was a limit to the extent to which she could take her future into her own hands but I just wanted her to be less reactionary. She spent a large amount of the book complaining about her situation but never really tried to do anything to change it. The romance aspect also didn’t work for me – as soon as anything remotely resembling insta-love appears in a book I immediately lose interest. I’m totally aware that I’m in the minority when it comes to my thoughts about this book and I’m disappointed that I didn’t enjoy it more. I think that it didn’t really match what I look for in a retelling and that’s okay – I already have a favourite Alice retelling in The Looking Glass Wars series, which twists the source material in a way that I enjoy. I rated Heartless 2 stars on Goodreads, purely because I had such high hopes for this book which, for me, it didn’t meet. As with all my reviews, this is just my opinion. Just because I didn’t enjoy a book doesn’t mean that you’re wrong if you did. I had serious reservations about posting this as one of my first reviews here, but I want to be able to share my opinion, even if I’m in the minority. Being honest about my thoughts on the books I’ve read is important to me and I refuse to be the kind of person who only says good things about books in fear of receiving negative comments. I’ll be honest, I was completely interested in the concept of this book as soon as I heard about it. It’s a rarity to find YA novels which are comfortable dealing with medical issues while staying away from the whole ‘tragic love story’ thing. I know, I know, suddenly it seems all generic and contrived, but Yoon manages to make Maddy such a well developed and strong voice that you can’t help but feel sympathetic towards a girl who falls in love despite having the knowledge that she can never leave her home. There is probably just as much focus placed on the relationship between Maddy and her mother as there is on the one between Maddy and Olly, which makes a refreshing change. The book is filled with illustrations which provide a unique way of telling the story without distracting from its sometimes heartbreaking nature. I wasn’t too sure what to expect from this book based on its synopsis, but I think it’s really well worth reading. The characters and story are so well thought out, and it provides an insight into topics which are very rarely addressed for the Young Adult market. I recieved an e-book copy of this book from NetGalley in exchange for an honest review.